From photographer James Bowden’s Flickr, via Magic Bus. They call it “Ball’s Pyramid.” It’s what’s left of an old volcano that emerged from the sea about 7 million years ago. A British naval officer named Ball was the first European to see it in 1788. It sits off Australia, in the South Pacific. It is extremely narrow, 1,844 feet high, and it sits alone. What’s more, for years this place had a secret. At 225 feet above sea level, hanging on the rock surface, there is a small, spindly little bush, and under that bush, a few years ago, two climbers, working in the dark, found something totally improbable hiding in the soil below. How it got there, we still don’t know. The sustainable fishing restaurant Bamboo Sushi commissioned this gorgeous, honest, stop motion look at how a meal of Sushi, comprised of fish from all over the world, comes to end up on your plate. It isn’t pretty. I’ve worse about eating sushi the more I learn about the process. Too bad Bamboo Sushi doesn’t have a restaurant near me. Austin Gallagher, Director for Beneath the Waves Film Festival, reminded me that tomorrow is the last day for submissions to the 2012 festival which takes place in Norfolk Virginia, March 21-24th. 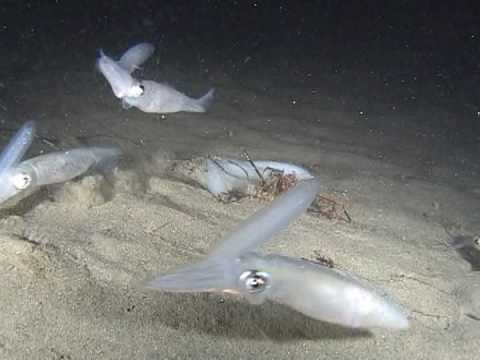 Here’s one of his favorite films from last year, called Squidilicious, about the annual southern California migration that market squid make to La Jolla Canyon. Photos from my recent reporting trip to the Bahamas with Doctor Neil Hammerschlag and his team from UMiami’s RJD Marine Conservation Program. Val and Pete have been swimming together every morning for the past seventeen years. Once a year they have a race, two laps up and back. *It’s not a documentary, and I don’t care that it is not. The photo set the Goodwin family has thrown down from the Marshall Islands is worth taking a look at.